^ Battle, Robert. untitled. Ancestries of Miscellaneous "Celebrities". Ancestry.com. August 23, 2006 [October 11, 2008]. ^ Ray, Mark. 童軍鷹章的意義. Scouting Magazine. Boy Scouts of America. 2007 [2007-01-05]. ^ Belser, Alex. 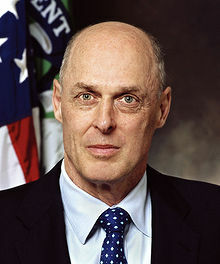 Paulson '68 to lead Treasury. The Dartmouth. 2006年5月31日. （原始内容存档于2007年3月11日）. ^ 8.0 8.1 The Nature Conservancy (2006). ^ 10.0 10.1 福布斯(2006). 亨利·保爾森. ^ Rutenberg and Andrews, Jim and Edmund L. 布殊選擇保爾森去接管財政部. 紐約時報. 2006年5月30日. ^ Heilprin, John. 布殊內閣有人相信全球暖化. 美聯社. 2006年6月2日. ^ White House (2006). 參議院議員確認保爾森成為財長. 2006年6月29日. ^ "保爾森認為社會保障改革希望渺茫 Archive.is的存檔，存档日期2013-01-30". 路透社, 2007年2月3日. ^ Michael Mandel. German and French banks got $36 billion from AIG Bailout. Bloomberg Businessweek. March 15, 2009 [November 14, 2010].